Have your antlers scored at the Palmetto Sportsmen's Classic! 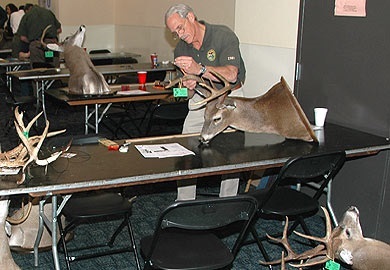 Each year at the Palmetto Sportsmen’s Classic, SCDNR wildlife biologists and wildlife technicians have an antler scoring station, located in the Ellison building at the SC State Fairgrounds, where hunters can bring their antlers to have them scored. Depending on the score, the antlers may be ranked on South Carolina’s all-time antler records list. The objectives of the state records list are to recognize outstanding animals and to identify areas that produce quality deer. This information allows biologists to take a closer look at habitat and deer herd conditions in order to make future management recommendations. Check out 2018 Deer Antler Records for more information. Please fill out these forms in advance to ensure the line moves as quickly as possible. Waiting times will vary depending on attendance. Drop the mount off at the beginning of the Classic, shop around, and then return to the Antler Scoring station to pick up your mount on the way out of the Classic. Hunters must provide necessary documentation, such as the date and county of the kill, and must sign a "fair chase" statement when they bring in a set of antlers for measuring. An accurate weight measurement at the time of the kill is also helpful. Antlers in velvet or those that are broken and repaired, or antlers separated from the skull plate cannot be officially measured for the state records list. If the lower jawbone of the animal was extracted during taxidermy or otherwise saved, it should be brought to the measuring session so biologists can determine the deer's age. Antlers don’t have to be from this year’s deer season. The scoring process is free but you must purchase an event ticket online or at the gate to enter the Classic.